Hey there, Web 2.0 still going at full force. Now no one really knows what web 2.0 means at this moment.. it has become so overused that it is actually FUNNY. So I say lets have fun with everyone else. You must have noticed how today if you want a cool website domain name you have to spell it funny and drop some vowels or add some or change some – whatever works. Anyways, I would say that the badge icons have become a Big icon in the web20 phase…and I would like to give out this free web 2.0 style badge in psd format. Yippeee. As you can see in the image below a nice “Koohl Kleen Whyte Badzh or you can call it a rounded cornr Starbrst” If web20 was a language this would be it. If you feel the same way let me know in the comments below. You can pick up the PSD here with layers intact. This is what it should look like. Previous PostGlassy & Vibrant Rss feed icon Tutorial – Vista Style.Next PostSome People who just don’t need Photoshop. Inspirational. Fantastic goods from you, man. White and Clean web 2.0 badge – Free PSD file I’ve understand your stuff previous to and you are just too excellent. I actually like what you’ve acquired here, certainly like what you’re stating and the way in which you say it. You make it enjoyable and you still care for to keep it wise. I can’t wait to read far more from you. 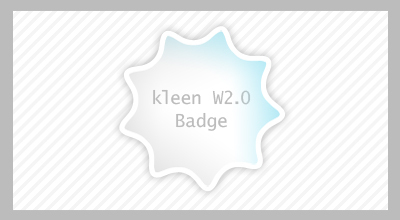 This is really a tremendous White and Clean web 2.0 badge – Free PSD file informations. I want to admit your clarity broadened my sentiments plus i will immediately grab your rss feed to keep updated on any new posts you may possibly make. Some truly excellent content on this website, regards for the contribution. It is a definitely useful web site. Many thanks for sharing! I’ve place your RSS feed into my blog. Iâ€™m impressed, I must say. Actually hardly ever do I encounter a weblog thatâ€™s both educative and entertaining, and let me tell you, you might have hit the nail on the head. http://www.saveonappliancerepair.net Your concept is outstanding; the issue is something that not sufficient individuals are speaking intelligently about. I am very completely happy that I stumbled throughout this in my search for something regarding this. nicely done. got this one. thanks a lot!